Every once in a while you want for something beautiful and delicate and elegant – something that makes you feel cared for and deeply nourished. Here’s a secret: Often, the most elegant and deeply nourishing cooking is also wonderfully simple and uncomplicated. The key then is to focus on the quality of ingredients, because that’s what can really make (or break) your dish. Things like pasture-raised eggs, rich in vitamins and carotenes, or wild-caught salmon, full of B vitamins and omega-3 fatty acids, are not only a more powerful source of nutrition than farmed alternatives, but they also offer better flavor as well. And who doesn’t love good flavor coupled with good nutrition? Wild-caught salmon is rich in omega-3 fatty acids, and has a more favorable ratio of omega-3 to omega-6 fatty acids than does farmed salmon. It is also particularly rich in niacin and vitamin B12, which help your body to metabolize fats and proteins and help you to maintain a healthy nervous system. Wild-caught salmon is also a great source of the antioxidant astaxanthin which, among its many roles, helps to protect the body from sun damage. Moreover, farmed salmon poses a risk to ocean ecology and are often fed antibiotics and an unnatural, supplementary soy-based feed. Those antibiotics can then pass into the ecosystem, potentially affecting other fish as well as sea mammals. This is why we recommend wild salmon, caught by hook-and-line to minimize bycatch, fished in the clean waters of carefully managed fisheries. You can support fishermen directly and order it online here. 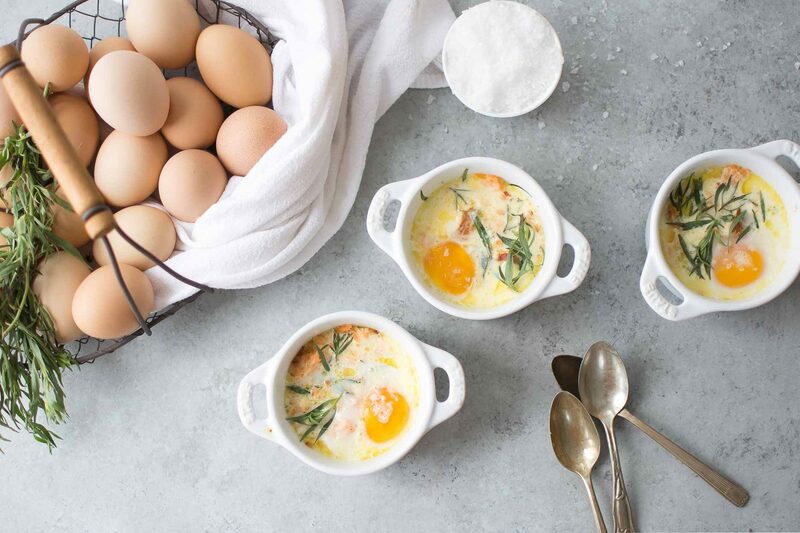 There's a lovely elegance to traditional baked eggs that belies its simplicity. 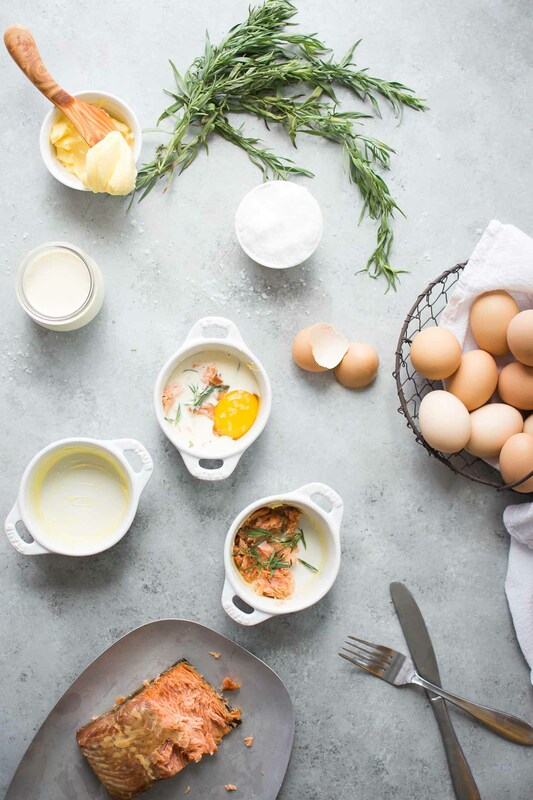 The eggs retain a delicateness that's further enhanced by fresh cream and balanced by meaty smoked King salmon and fresh herbs. And it only takes five minutes to prep the ingredients before you toss them in the oven. 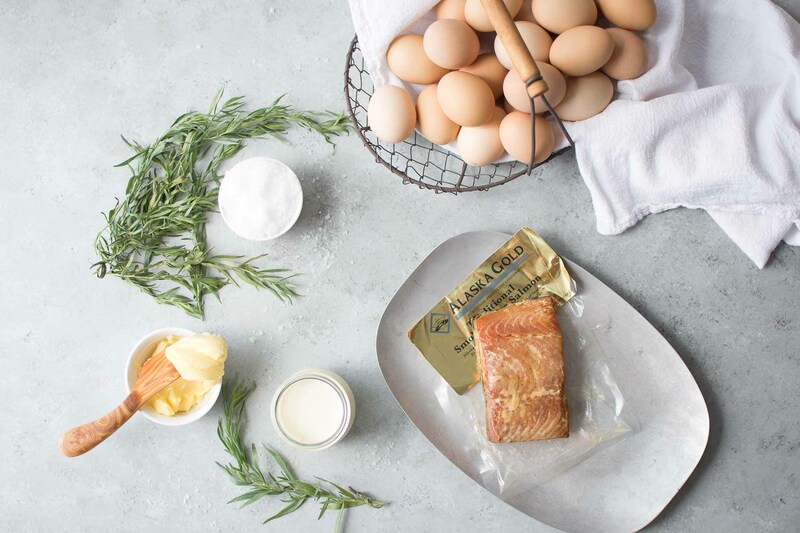 We developed this recipe in partnership with Alaska Gold by the Seafood Producers Cooperative, using their wild-caught traditionally smoked king salmon. Heat the oven to 350 F, and then butter the mini cocottes. Set a kettle on the stove to boil. Crumble an ounce of the smoked salmon into each of the cocottes. 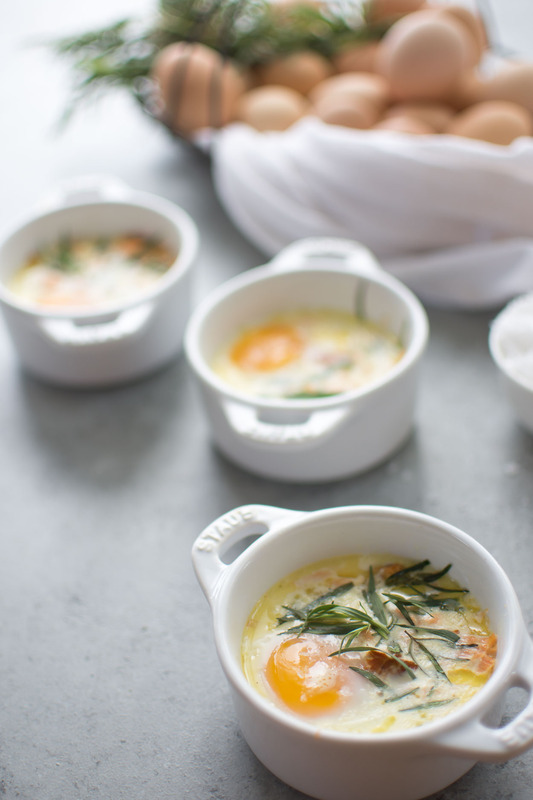 Top the salmon with tarragon leaves, and then crack an over the salmon and tarragon into each cocotte. Spoon 2 tablespoons heavy cream over the eggs, and sprinkle them with a pinch of flaky sea salt. Place them into a baking dish, and cover the cocottes with their lids. If you're using ramekins, cover them with foil. Pour enough hot water into the baking dish so that it reaches half-way up the sides of the cocotte. Transfer the baking dish to the oven, and allow the eggs to bake, undisturbed, until the whites are set, but the yolks are still runny - about fifteen minutes. Remove them from the baking dish, uncover, and serve immediately. Need a dairy-free version? Skip the cream and keep an eye on them as they bake so that the whites don't become overdone. Coconut cream and milk do not make a good dairy replacement in this recipe. Don't have tarragon? Dill or fresh chives will work nicely here. One of the best ways to ensure that you’re getting wholesome, authentic real foods to the table is to buy as closely to the original source as you possibly can. Shopping at farmers markets, or through a local foods delivery service can help. But when it comes to coastal foods like fish and salmon it can be tough to avoid that lengthy chain of suppliers, buyers and middlemen, especially if you don’t live near the ocean. It’s a shame because the real stuff – line-caught truly wild salmon caught by independent fishermen earning a fair price – is so good for you. Fortunately, you can buy directly from fishermen online, getting authentic, line-caught wild salmon delivered to your door. Alaska Gold Brand by the Seafood Producers Cooperative, a fishermen-owned cooperative, allows you to do just that – source your fish directly from the the fishermen themselves where they’re committed to sustainable practices, reducing bycatch, and catching one fish at a time. And their smoked salmon is amazing. It’s cured without nitrates or nitrites, and its only ingredients are just what you’d expect: salmon, salt, brown sugar and smoke. Oily fish, brimming with heart-protective omega-3 fatty acids, are a vital component of a nourishing diet. While eating plenty of good quality oily fish like salmon, anchovies or sardines can support your health, it’s not the only thing that matters. Indeed, how a fish is caught can make a world of difference, too, which is why aiming for wild salmon caught by hook-and-line is a good choice. A few times a week, we’ll put wild-caught salmon on the table. You can see all our salmon recipes here, but I’ve added a selection of our favorites below. Salmon Baked in Cream and Herbs is one of the most popular recipes to come from the Nourished Kitchen cookbook. Rich with flavor, salmon is one of the few fish that can stand up to cream successfully, and when you partner that cream with herbs you have a stunningly simple, but delicious dinner. Salmon Chowder pairs salmon with fresh dill, creamy potatoes, leeks and a dollop of nutrient-packed salmon roe. Salmon with Honey Chipotle Bourbon Butter has just a hint of sweetness coupled with a punch of heat for an easy week-night dinner. You could try and let us know how it works for you. I will be making this recipe, tomorrow morning for our “Mothers Day” breakfast, I can hardly wait, I know it will be totally delicious. So glad! I hope you love it. These were amazing. Loved by the whole family, including 2 & 5 year old. All bowls cleaned, thank you for the recipe! I am SO happy you liked them!